After downloading all KH2 clips, i decided to make a KH wallie. wah...I like the style of your bg..like a 3D palace or something but the scan quality is different with the bg so it doesn't quite fit.. =.="
That looks very neat! Wow, you spent 8 hours on it? That's a lot of time but that's how much time one must take in order to make a good wallpaper. You did wonderfully! Fuer sich selbst betrachtet ist der Hintergrund ziemlich gut, aber ich finde, er passt nicht so recht mit den Figuren zusammen. Die Charaktere und der Tron sind von der Qualitaet sehr scharf, waehrend der Hintergrund verschwommen ist. Der Kontrast zwischen beiden ist zu krass wie ich finde. Beim Vorhang hast du das mit dem Pattern ausgeglichen. Das koenntest du doch bei der Tapete auch machen und ein Pattern auf einer Tapete wuerde doch gar nicht so schlecht aussehen, oder? ich mag das wall, auch sehr ... der spruch ist echt toll und passend aber der Hintergrund wirkt echt etwas "leer" und "Trostlos" aber die effeckte sind toll .... mag das sehr ... vielen dank dafuer! gefaellt mir gut, der hintergrund passt super zu dem bild! Look so nice ! It fit well with the background. I love it ! Nice colour too. Thank for sharing ! 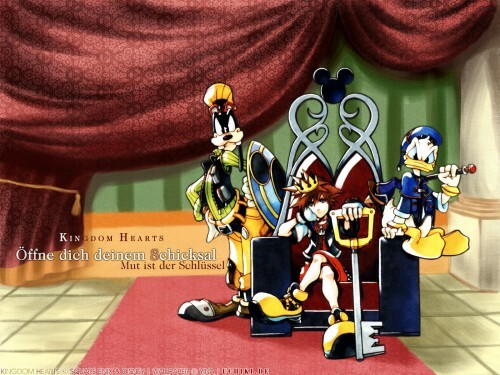 weee kingdom hearts wallie :D like the way how colouring is made, it looks so soft. also curtains are wonderful :) scan fits so well with everything, but isn't the throne supposed to be in the middle of red carpet XD good job and thank you for sharing ! oh so cute! but the don't looks like they are really standing on the carpet...maybe depth in the shadow can help? bg looks totally awesome! matches well and yeah i like those two phrases too. german right? cools. Wow! The texture on the curtains is amazing! love this wallpaper looks like areal thrown room . . . question what does the text mean?